Refufest is a cultural, artistic and social festival, happening for the 13th time in Prague. This year we are putting considerable effort into accessibility. Not only will the festival stay free of charge but it will take place in the heart of the city, in the centrally located Kampus Hybernska. Refufest is growing in popularity and is loved by Prague’s inhabitants. It has bloomed from a small gathering led by a local community to a two-day festival celebrating the Czech capital’s impressive diversity and unique cosmopolitan character. Thanks to its cheerful approach and wide variety of activities, Refufest creates a special occasion for people from different ages and backgrounds to meet, connect and learn from eachother. Refufest’s existence relies almost entirely on the active participation of passionate volunteers which also lend the festival a remarkable feature. 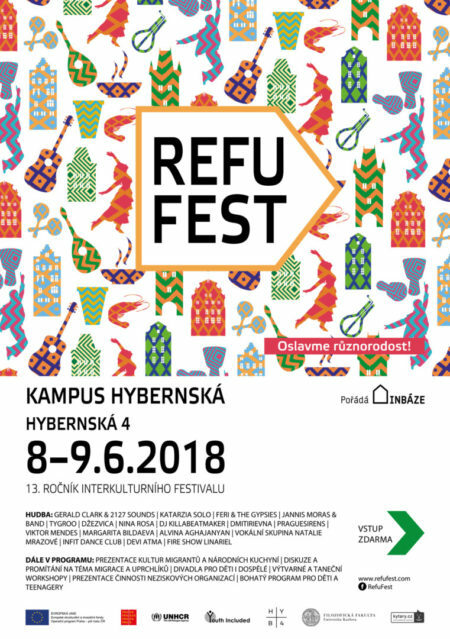 Since two days is not enough to showcase all the talents and skills of the city’s local and international communities, this year the Refufest team has prepared a rich program of side-activities. In April and May, we will be hosting a series of events and workshops at least once a week to open the appetite for the spirit of Refufest. This program includes a dance workshop, a run in Karlovy Vary and a vegan cake cooking workshop to name a few. The festival itself starts on Friday 8th of June in the afternoon. The first day will be dedicated to presenting NGOs who are working to empower refugees and migrants as well as launching the festival with a lively debate, an opening of the exhibitions, concerts and a film screening. The second day, Saturday 9th of June, will begin with a program of theatre and workshops devoted to children. In the afternoon we will kick off with concerts so diverse that everyone will find something for themselves. Migrant community stands will offer traditional dishes and present their culture in creative ways. Dance, music and art-and-crafts workshop will be held and artists will lead guided tours through the exhibitions. Film projections, open-mic, interactive installations and much more are on the program! “Hear the beat of a drum, the laughter of children, and the cheer of foreign sounds. Smell the spices and sweets from around the world. Listen to stories of distant places and long journeys, uprooted and re-rooted in new lands, sometimes welcoming, sometimes hostile. Share life experiences vividly through human libraries, photographs, virtual reality and films. Speak the universal language of dance and music. See a spectacle of color, love and diversity”.